We are a full service real estate brokerage and property management company serving all of Central and Southwest Florida. We specialize in the management of single-family homes, condominiums and multi-family apartments. We promise to always be honest and actively communicate with all of our clients. We tailor our services to fit your needs in order to provide exemplary service! In Central Florida, we have homes in Orlando, Winter Park, Maitland, Casselberry, Altamonte Springs, Sanford, Lake Mary, Winter Garden, Windermere, Clermont, Kissimmee, and Longwood. In Southwest Florida, we have homes in Cape Coral, Fort Myers, Naples, Bonita Springs, Port Charlotte, Punta Gorda, Sanibel, and Pine Island. If you don't see the area you're searching for, give us a call to see how we can help you! Every quarter, we send newsletters to our Resident and our Owners, specifically tailor-made with them in mind. Each newsletters contains information designed to serve you better. I-4, known as the backbone of Central Florida’s transportation, is getting a major upgrade. From aesthetic upgrades and a more open-air feel, to additional lanes to accommodate higher traffic volume, this project is a 21-mile undertaking. The project stretches from Kirkman Road all the way throughout downtown Orlando, continuing north to Longwood. The goal of this project is to connect communities, improve economies and enhance livability. 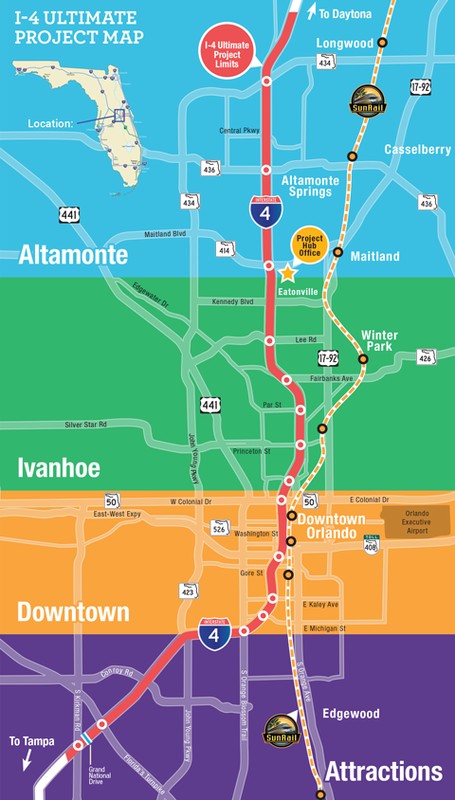 The future of I-4 is aimed to be broken down into 4 main areas to include the attractions, Downtown Orlando, Ivanhoe and Altamonte. Starting at Kirkman Road, a new overpass will allow pedestrians to cross from the parks to hotels allowing traffic to flow more seamlessly. The current pedestrian crosswalk will be replaced with an overpass, to allow the smoother flow of traffic as well as less interference between commuters and park-goers. Below, see the I-4 Ultimate’s project limits and what the overhaul entails. 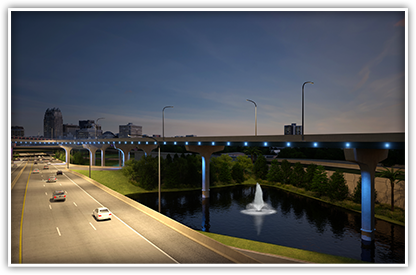 Continuing into Downtown, you can expect new aesthetic highlights including accent lighting, illuminated fountains, update architectural bridges and even the implementation of more plants native to our area. Continuing north to Ivanhoe, commuters will experience auxiliary lanes intended to ease the flow of traffic. These express lanes are will continue throughout the Altamonte area. Commuters can opt in or out of traveling on these lanes and the pricing will be dynamic based on demand and usage. Travelers will be able to enter and exit these lanes at multiple locations throughout the ultimate I-4 zone. Some of the aesthetic changes commuters can expect with the project, seen above. If you frequent the 21-mile stretch, drivers can access alternative routes to avoid construction as well as familiarize themselves with routes that are inaccessible during the construction phase. Construction is not meant to halt or ultimately hinder traffic, but it certainly can impact daily commuter’s routes. Perhaps this is a time to explore different transit options. My personal favorite, the Sun Rail, is expanding to be able to allow commuters late night service for weekday travelers. This may be an inexpensive way to avoid the I-4 hassle that is likely to continue until the project is complete in 2021.